Learn nine techniques using watercolor pencils and easy-to-follow instructions. 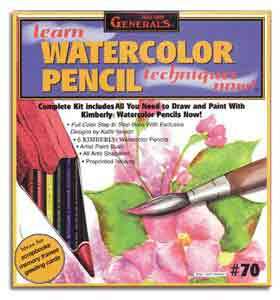 This watercolor pencil kit supplies everything needed to create six watercolor paintings. The set features six watercolor pencils, an artists brush, a pencil sharpener, preprinted patterns and a full-color step-by-step book. Series 400 Watercolor, Cold Press, 9" x 12"